So Fox gets the controversy juices flowing…tying Lonnie Lynn, Jr. (a thuggish name if I’ve ever heard one) to the controversial Rev. Wright, then spends all day talking about it…parsing the relationship…googling the internets…hoping to find that one tasty nugget of juicy innuendo to repeat over and over. Then Hannity finds the nut, like a blind squirrel leading a million blind squirrels. He does so leveraging the fatal flaw of many outraged conservatives, their inability to think poeticly. 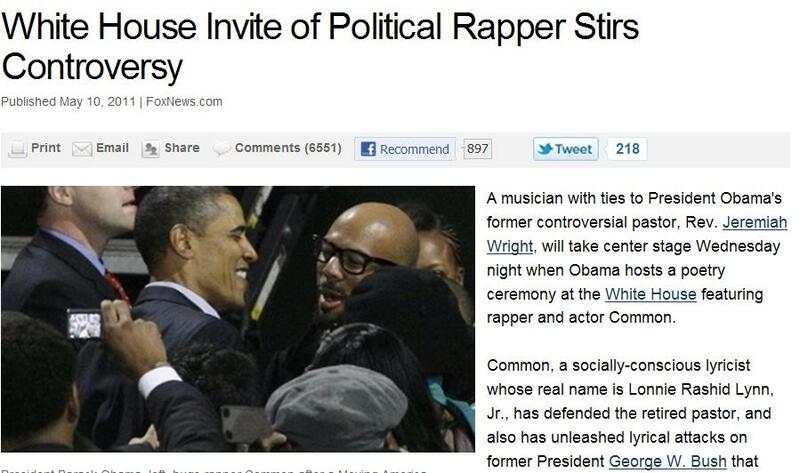 Should Controversial Rapper Have Been Invited to White House? [Sean Hannity] It seems this administration will never learn its lesson. Tomorrow, Michelle Obama is set to host an evening of poetry and will welcome a slew of poets, musicians, students from all across the country to the White House. Among them is a controversial rapper and poet, Lonnie Rashid Lynn Jr., better known as Common. Now, he’s a staunch supporter of the president and has a running list of controversial comments. Quick note: I’m not sure what “lesson” Hannity was going for here, my guess it’s that Fox can make a controversy out of anything by making a controversy out of anything, and that no matter what Obama does, Fox will make a controversy out of it. So that’s the context. Hannity is declaring how Common (or “Lonnie” as I like to think of him) threatened to “burn George W. Bush” and promotes cop killing. HANNITY: Whoa! “When we roll together with a strapped gun, we’re going to be rocking them to sleep.” That sounds like killing cops to me. HANNITY: Whoa, that sounds like killing cops to me. Sounds like killing cops to you? WEBB: Sound like killing cops. So that’s why Common is controversial, Hannity has decided he is talking about killing cops for fun and burning George W. Bush. Explanations to the contrary ARE NOT TO BE TOLERATED!! That, of course, is an insanely ridiculous reading…yet somehow that is what makes into Fox’s next story on the nontroversy…note the same picture, new date…but now…the Rapper himself has become controversial…and the White House is defending the Controversial Rapper. Controversy Stirred, err, Mission Accomplished! 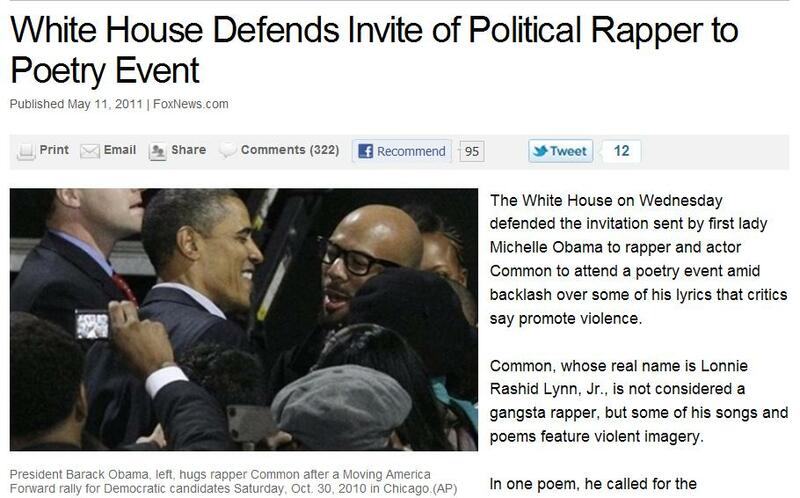 "backlack over some of his lyric that critics (MAINLY FOX NEWS) say promote violence (ANYONE WHO HAS LISTENED TO COMMON KNOWS HOW SILLY THIS IS)"
Common, whose real name is Lonnie Rashid Lynn, Jr., is not considered a gangsta rapper, but some of his songs and poems feature violent imagery. In one poem, he called for the metaphorical burning of President George W. Bush — a “burning Bush.” And in a song, he praised convicted cop-killer and former Black Panther Assata Shakur. “While the president doesn’t support the kind of lyrics raised here, we do think some of the reports distort what Mr. Lynn stands for more broadly in order to stoke controversy,” White House spokesman Jay Carney said Wednesday. Note in the photograph how the “critics say” has now made it into the first paragraph. Those “critics” are named Sean Hannity and whoever else was on Fox the day previous. 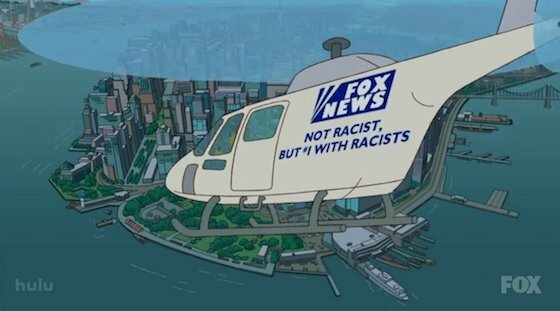 That Fox is the one making the news is not considered, by Fox, to be part of the news. So the White House then properly calls out that this is a nontroversy based on a very selective reading. And I further point out that this entire narrative is built for some people who are VERY SCARED of gansta rappers from the Chicago ghetto who like to kill cops and LOVE OBAMA…and now Fox has gotten the White House to respond and has officially CREATED a story it can run with and avoid pointing out how Obama is the only U.S. citizen (long form and everything) in history to kill Osama Bin Laden for another week. The next version of their long-running dog whistle series. (If you don't believe this to be true, go read the comments on the two linked stories, I dare you). UPDATE: Karl Rove goes all the way to the hyper dog-whistle land, and repeatedly labels Lonnie a “thug”. And after all, why not..he’s black..he’s a rapper…obvioulsy he’s a thug by definition. Note also how Karl accepts Hannity’s nuanced reading of Lonnie’s poetry as absolute fact. KARL ROVE, FOX NEWS CONTRIBUTOR: Thank you, Sean. Thanks for having me. HANNITY: All right. Well, you know, this is a poetry event. And the evening of poetry at the White House. And, you know, as we look into the background, the lyrics, the statements about cops, and President Bush and some of the other controversial things. Do you think this was an appropriate invite? ROVE: Yes, let’s invite a misogynist to the White House, a guy who’s called for violence against police officer, and called for killing the former president of the United States George W. Bush. This will set a good tone for the country. President Obama last week said he wanted to recapture that special moment we had after 9/11. And here week later, we have an example of how this White House can recapture that moment by inviting a thug to the White House. A man who call for the death of Mr. Obama’s predecessor in office. HANNITY: Well, I’m trying to understand this, and you know, Secret Service guys, if you make a threat like that, being in a song or in poetry, wouldn’t the secret service take a little visit to your house? ROVE: Well, no, not necessarily. A few things to note so far…Rove has gone off the rhetorical deep end, and now Lonnie turns out to be the real Bin Laden. Second.. this last bit is a full on lie. You write a song about assassinating the President in no uncertain terms, YOU WILL get a visit. Lonnie didn’t, meaning the Secret Service is about a thousand times more hip than Rove. Rove keeps repeating these lies, knowing that repetition of the lie is necessary for it to become “common wisdom”. ROVE: [continues] But vetting these people, certainly somebody inside the White House had an ounce of sense and looked at his lyrics and could have said, you know, what, this is going to be offensive to the American people. It’s going to be offensive in the moment that the president is trying to establish here. Maybe we ought to think about somebody else to invite. But no, they are inviting a guy who called, I repeat, for the previous president to be assassinated for violence to be committed against police officers. And whose lyrics are sexually explicit and misogynist. This guy is a thug. And why they are inviting him to poetry night at the White House, speaks volumes about President Obama and this White House staff. [Rove] : President Obama does not believe the things that he says. If he believed last week that he wanted to reestablish the great tone in the country after 9/11, why would he invite a thug to the White House who said, he wanted to kill President Bush for having taken the country to war in Iraq. Now they just sit back, and watch the derp spread. The derp about Lonnie Lynn, the thug ganstah poet from the streets of Chi-town. UPDATE2: Looks like I beat the Daily Show to the punch on this by virture of not having an 11:30 timeslot. I think they did a better job, though.